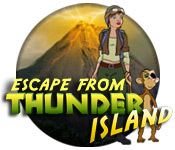 Escape from Thunder Island is rated 3.4 out of 5 by 30. Rated 5 out of 5 by AdrianaIP from Fun throwback to 30's serials. This is a fun game, with a storyline that is not to be taken too seriously. There is always a tension between a game storyline and the minigames, and HOS. The minigames are supposed to be fun,a nd they are, BUT, if the storyline is too gripping, they can be irritating. There are two solutions. One keep a good storyline, and make the minipuzzles and HOS easy, and relevant, and another, concentrate on the minigames, and make the storyline less compelling. This storyline, is never meant to be taken seriously, what with the protagonist being always rescued by her smart monkey, and her attributing it her "luck", and with cliffhangers out of 30's serials. 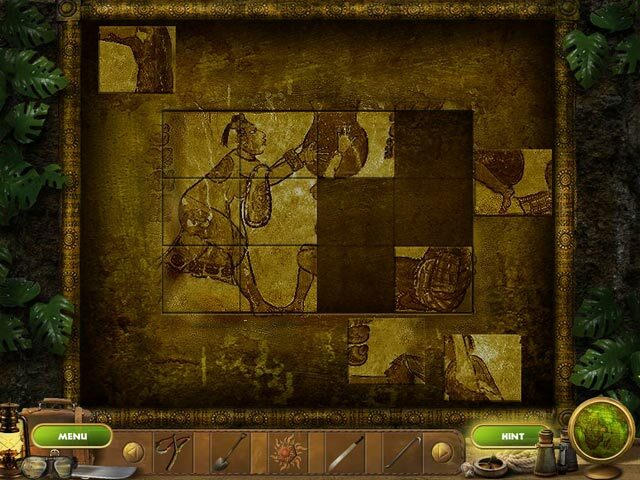 That allows you to enjoy solving the puzzles, which are a bit more challenging that you'd think. A good fun game for everyone. Rated 5 out of 5 by Knginatl from Marbles the monkey!!! I love these Rita James games! They are so much fun, with hilarious cutscenes throughout the games. The only negative is the graphics quality. It's a bit fuzzy and hard to see things sometimes. But I would rather play a fun game like this one with lesser graphics than a "pretty" game that is boring! We need more Rita and Marbles adventures!!!! Rated 5 out of 5 by marlena362438 from the great adventure As my title says this is an adventure, not really a game as such. Everything was just fascinating, however the only shortcoming were the puzzles. They were so hard to solve. Better pictures could have been used so we could fit the pieces in better. Could you personally thank the one who thought up this story and also thank Bobby James for his splendid music. I just love, love, love the music. please provide a strategy guide ok? Rated 5 out of 5 by elvygames from Better than I expected. I really enjoyed this HOG, although at first glance I was skeptical. The cut scenes were not great, and the story line was weak, but the game itself was surprisingly challenging with lots of features rarely seen in other HOGs. 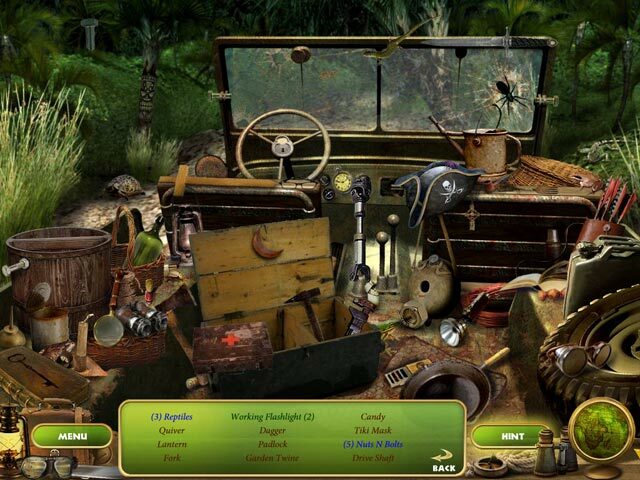 There is a hint button which will reveal a hidden object as expected, but when I wanted help on how to solve a puzzle or where to go next, the hint button only gave me very general directions. This made the game challenging and made me think. I found that I was soon able to figure out the puzzle and the next step. The MAP feature was VERY helpful telling you what task needed to be done in each location and also telling you when that location was finished. The game lasted longer than I expected and I was pleasantly surprised each time a new chapter began. There is NO skip button for the puzzles, but there is one for the cut scenes. Usually I hate games with no skip button for puzzles, but these puzzles were challenging yet NOT impossible. I found that a little logical thinking led to the solution quickly enough. Hope you enjoy it as much as I did. Rated 5 out of 5 by ffuryy50 from Loved this game! Can't wait for the sequel on Shangri-La! This game is great fun! It's the first one I actually turned off my tv -- normally, I watch tv while playing a game, but this was such fun, I turned the tv off and just totally immersed myself into playing and enjoying the game's entire experience.... The characters are fun -- a kind of Indiana Jane meets the chimp from Jungle Boy... I love the characters, the voice-overs are some of the best I've heard, and the music is similar to a movie score, which fits in perfectly with the theme of old movie serials from the 30's and 40's... This game is totally enjoyable.... The puzzles are tricky but not impossible.... there aren't too many HO scenes (a huge plus for me).... in fact the balance in the game is great. The story line is done so well, even tho you've seen similar plot lines, this will keep you entertained from beginning to end. You can skip the cut scenes if you want, but why would you? You'd miss out on so much if you did! ;) And for those of you who are tired of the occult themes in so many of the games, you'll find this a really nice change of pace ;) The map is your best guide in the game. There's not too much running back and forth. And the game is a really good length (tho I would have liked for it to go on and on). I really enjoyed this.... Can't wait for the next one in this series! Rated 5 out of 5 by abitmore from What a Wonderful Surprise! I don't get to say that too often but this game certainly was a wonderful, pleasant surprise. I'm not sure how I missed it when it came out, but I did, lol. Luckily, I corrected that mistake and decided this game looked good, I was going to download it and give it a whirl... The Intro was great - I was ready to sit back and watch the movie. The cutscenes are also very good. This game had a real storyline with a beginning, a middle and an end but most importantly, stuck to the storyline throughout the game. I don't remember there being any unaddressed issues left hanging out there as is so often the case. There was a lot of humor which I always welcome and appreciate - poor Marbles the Monkey, lol. The graphics were very nice. For the most part, I didn't have any trouble finding objects except for a handful. The hint system worked nicely. Each chapter was different than the others and if you played to the end of a chapter, it would be a lot easier to leave if you must and come back at a later date to begin a new chapter. The puzzles were interesting and some (I'm thinking the jigsaw puzzles), could be quite difficult. I had to find a walkthrough and take a picture of the finished puzzle in order to finally solve them, I'm ashamed to say - and I LOVE jigsaw puzzles. I've played this game twice now and am ready for a third time - it's that good. 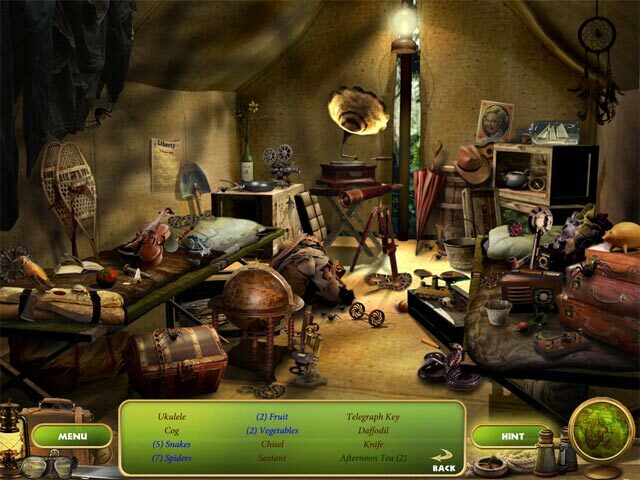 I'd gladly recommend this game to anyone who is a fan of adventure/hidden object games. Rated 4 out of 5 by hermitcave from I found this one fun to play I played the sequel Shangri La first and didn't enjoy it as much as this one. It was funny, quirky and I enjoyed the flow of the game. Yes, there are a lot of repeating style of puzzles especially the complete the picture types where you have to find the pieces and put them in their right place. The graphics are the cartoon type cut scenes with good voiceovers and it is divided into chapters much like the old TV serial type programs. The story was better written than Shangri La and pretty easy to follow. You often had several directions in which you could go so it was helpful to have a task list. There were some funny parts especially with the poor monkey who is the real hero but never gets the credit. The HO screens had some small objects that required you to really look closely to find. There is a skip button for all of the mini games. Rated 4 out of 5 by denniann2 from a pretty hard game for me there were no skips so i didn't get along so well. you have to wait for the hint button to recharge to finish the mini games if you can't get them or you have to go to the WT. it is a typical rita james game. marbles the monkey does most of the saving, but rita gets the credit. marbles gets fed up but his curse words are asterisks and symbols. you have to collect puzzle pieces to put pictures together and 80 coins or more through the game in order to see the extra at the end (after the credits) which introduces the sequel...... good graphics and all, but NO SKIP BUTTON.